The second collection of Flaming Crab Games’ archetype-books clocks in at 15 pages, 1 page front cover, 1 page editorial, 2 pages of SRD, leaving us with 11 pages of content, so let’s dive right in! The first archetype herein would be the Blood Scoundrel Bloodrager, who begins with perhaps one of the oddest decisions regarding spellcasting – instead of the highly restrictive bloodrager spells, the archetype instead gains access to all enchantment and illusion spells from the wizard spell-list. Ouch, but let’s see whether the rest justifies that. The archetype adds Bluff, Disguise, Sense Motive and Stealth to the class-skill-list. They also receive proficiency in rogue-y weaponry as well as the option to cast bloodline spells (and only those!) in light armor sans arcane failure. Instead of a normal bloodrage, these guys receive a +4 morale bonus, increasing later to +6 and +8 and the archetype receives no penalty to AC and may still use Int-, Dex- and Cha-based skills. Instead of uncanny dodge, which is moved to 4th level, where it replaces Eschew Materials,, 2nd level provides Sneak Attack, which scales up by +1d6 every 4 levels thereafter. A blood scoundrel may elect to choose a slayer talent in lieu of a bloodline feat, with 12th level providing access to advanced slayer talents. DR is replaced at 7th level by improved uncanny dodge – I assume, eating the whole of damage reduction, not just the first increment. The archetype is pretty solid and rather interesting and features quite a few interesting tweaks. Granted, I’m not a big fan of the spell-list, but the requirement of materials etc. does offset this a bit. On a nitpicky side, the archetype’s 5th level is dead, with improved uncanny dodge being moved to 7th level. Chakram Dervish fighters are locked into Quick Draw as the 1st level bonus feat and replaces bravery with a scaling dodge bonus versus ranged attacks. 3rd level replaces armor training with the ability to treat dual-wielding chakrams as light weapons and also eliminates penalties to wielding them in melee as well as eliminating the chance to damage himself. 5th level provides scaling bonuses to atk and damage as substitutions for weapon training and 7th level eliminates AoOs when throwing chakrams. 9th level provides dual throwing and 11th level allows the dervish to move up to his speed and make a full attack with chakrams at -2 to atk…which is pretty strong. At 15th level chakrams automatically return whether they hit or miss, allowing for full attacks with just one chakram in the hands. 20th level nets auto-confirms of crits and increases the crit modifier by +1 (to x3). The character also can’t be disarmed. The Dread Thane skald adds all spells with the fear-descriptor of 6th level or lower to his spell-list and gets +1/2 class level to Intimidate…which replaces bardic knowledge. Instead of song of the fallen, the archetype receives a song that causes the shaken condition. 2nd level provides +2 to damage versus shaken foes, scaling up to +4 versus frightened and +6 versus panicked foes at 8th level. 4th level fear immunity replacing uncanny dodge, which is imho a bit soon. 7th level nets a horrific visage while singing penalizing saves of nearby foes (10 ft) by -4 and eliminating fear immunity in that range. The range increases by +10 ft at 13th level and 19th level instead of versatile performance. The Eldritch Sage magus gets only simple weapon proficiency (no armor/shield, no martial weapons), but gains spells per day at +1 level. Arcane Pool gains full level + Int-mod points and may expend them as a swift action to increase the save DC of magic items used or spells cast by +1. 10th level allows for the expenditure of 3 points for a +2 increase, while 20th level allows for the expenditure of 5 points for +3 DC. Spellcombat is modified to instead apply to casting spells and using magic items…or at least, it’s supposed to, I think. The archetype fails to specify which kind of abilities they replace – while it’s pretty evident for the respective levels, this still constitutes a comfort detriment. And yes, this means duel spellcasting via wands…and this is pretty much problematic on its own. Similarly, 2nd level’s Dual Spellcasting, which allows for the casting of two spells at once, provided they’re one level lower than the highest spell level available and needs two free hands for the trick. I *get* why this is here – it’s there to replace spellstrike, a mighty ability…but double spells are a tricky thing that is usually a 20th-level CAPSTONE. For a reason. Worse, the lack of limitation to spells from the magus spell-list allows for a nasty two-level dip here. 5th level and every 6 levels thereafter net metamagic/item creation bonus feats. 7th level allows the magus to expend spell level arcane pool points to recall a spell activated from an item, allowing the character to recharge it. This does not work on empty items…but is still pretty powerful and necessitates that the GM takes careful heed regarding low-charge wands, staves, etc. As a capstone, the no-highest-spell-level limitation is taken off dual spellcasting and the character uses his own CL when using wands, staves and rods. Oh, and he may charge depleted items. This archetype is broken. The Faithful Paragon warpriest must be LG and gets additional access to the paladin’s spell-list – which is pretty insane, considering the exceedingly powerful paladin spells being balanced so they become relevant at 4th level, not 1st. And we all know at least a couple of very powerful such spells – when extending them to the arsenal of a full spellcaster, they turn ugly fast. The archetype also receives + Cha-mod fervor and moves sacred weapon to 4th level, treating it as class level -3. 4th level provides Cha-mod to saves instead of channel energy, while 7th level replaces sacred armor with the option to, as a swift action, gain temporary hit points equal to Cha modifier TIMES HD – but thankfully, only 1/day, +1/day at 14th level. 9th and 18th level increase fervor dice by one step each and replace the respective bonus feats. Overall, a more paladin-y warpriest whose epsllcasting remains his one issue: Plus pala-spells is a pretty big thing that eliminates this one at my table from the get-go. The Grasslands Prowler ranger has a unique combat style based on movement (and keeping enemies close) as well as natural weaponry, replaces Endurance with Fleet and adds some druid-y-themed spells to his spell-list. He’s locked into plains as terrain and gains fast stealth at 7th level, pounce at 16th. No complaints here. The Katana Duelist does not receive any armor or shield proficiency and gains an Int-based scaling AC-bonus that also applies versus touch attacks. He’s locked into katana weapon expertise and replaces mounted archery with +2 to Ref-saves. 5th level provides Parry instead of banner, which allows the character to forego attacks of his full attack, storing one attack to later, as an immediate action, use as a competing roll versus the attack. On a success, he negates the attack. While I’m not a fan of competing attacks, size-based penalties and the option to, at penalty, parry attacks on adjacent allies, make this okay. 14th level’s Riposte allows for an AoO to follow up on a parried attack. The Mad Prophet oracle gets 5 curse/madness-themed bonus spells and may, at 1st level, mark foes as doomed souls as a full-round action, penalizing the saves of the target versus the mad prophet. The action required decreases at 8th level and 16th level, while the penalty becomes more severe. This replaces the 1st level revelation. 7th level allows the mad prophet to 1/day cause a target to suffer a freak accident determined by consulting a random d% table with 14 entries. All of these are nasty and they range from mummy rot to negative levels voice loss to being subject to auto-confirmation when crited for a period of time. The effects are powerful, but based on a save and higher levels net additional uses. I quite like this one – flavorful, a bit odd…kudos! The Myrmidon swashbuckler only receives panache when scoring a critical hit or delivers a killing blow with a performance weapon and the archetype begins play with “the benefits of the Weapon Focus feat in one performance feat of her choice” – I assume that should be performance weapon. The myrmidon substitutes Charisma for Intelligence for the purpose or prerequisites of combat feats, replacing swashbuckler’s finesse thus. Instead of the derring-do deed, the archetype can spend 1 panache to add a surge-like 1d6 to a given performance combat check, with 6 providing the means to reroll and add – essentially, the surge is an exploding die. Instead of 15th level’s swashbuckler’s edge, the myrmidon may take 10 even when distracted or in immediate danger…which is a bit odd, considering how good specialists of this trick become. (My current game features an insane gladiator performing for the crowd in his head…) 19th level provides a means for the myrmidon to decrease the attitude of crowds towards the target of his critical hit by two steps, with DC being equal to damage taken…which means the check is impossible for x3 and x4 weapons of even a moderately competent myrmidon, nigh impossible for x2-weapons. At 4th level, the archetype may replace a combat feat with a performance feat instead. 5th level provides scaling +atk and damage bonuses as well as Improved Critical for performance weapons. As a capstone, the class auto-confirms performance weapon critical hits and increases crit modifier by +1. This one is weird – I *LOVE* archetypes that do interesting things with performance combat, mainly since the mechanic is underrepresented and has potential. However, it’s very niche unless an archetype (like some by Everyman gaming, for example) allows for a way to treat regular combat as performance combat. The lack of such a mechanic here and the slightly wonky components mean that, alas, there is no more reason to take mid-to-higher levels in this archetype than for the base swashbuckler. The Nightmage rogue is locked into minor magic at 2nd level and 4th level nets prepared spellcasting based on Int, with spells known like a ranger and the spell-list being all abjuration, divination, enchantment, illusion, transmutation and universal sorc/wiz-spells. This replaces all rogue talents and CL is, analogue to ranger, paladin et al., class level-3. Solid, if somewhat unremarkable take on the casting rogue. The Quickblade fighter gets Acrobatics as a class skill and they are locked in Dodge and Mobility as bonus feats of 1st and 2nd level, meaning you’ll be stuck with 2 levels of passive feats…not too exciting. 2nd level provides +5 ft. speed when not wearing medium or heavy armor or a shield heavier than a buckler, increasing the bonus by +5 ft. at 6th level and every 4 levels thereafter. Instead of armor training, the archetype gets a scaling dodge bonus and 5th level provides 1/charge direction change (NICE!) and may continue to move after a charge, provided there is movement left. 9th level is pretty sick: Full-attack charge that can be dispersed between target of the charge and any foe threatened during the charge – an ability usually valued as significantly more powerful. 13th level allows the quickblade to expend a standard action to duplicate an extraordinary variant of haste for 1 round/level, thankfully not stacking. 17th level allows the quickblade to perform +1 standard, move or full-round action in a given round, with escalating conditions (fatigue, exhaustion, unconscious) thankfully preventing abuse by explicitly stating that curing a previous condition does not influence the following. 19th level provides a 20% miss chance when moving full speed in a round and 20th level makes haste permanent. This archetype is odd – the high-level tricks are unique and pretty well-made, if not perfect in their craftsmanship…but the low levels are passive and boring…and 9th level’s ability could have really used a scaling mechanism to bring it more in line with the options – the charge/full-attack exceeds pounce in flexibility, which is pretty much one of the most powerful offenses. The Righteous Flame Acolyte replaces lay on hands and mercies with a melee touch attack as a standard action that deals 1/2 class level times 1d6 damage, half of which is fire, half of which is “holy damage bypassing resistances and immunities”, slightly deviating from the usual wording, but you get what’s meant. That being said: There is no “holy” damage in PFRPG anymore…so purists may still balk at the exact wording here and long for the default. The ability can be used level + Cha-mod times per day, and, as a swift action, the paladin can expend two uses as a swift action to add this damage to the melee weapon. I *assume* this bonus damage does not multiply n critical hits, but I’d still appreciate the ability stating it. 5th level replaces divine bond with the option to make “iterative attacks with his weapon in addition to using his Righteous Flame Strike as an off-hand attack.” Okay, got this – I assume this still requires a full-attack instead of being activated as the usual standard action of the righteous flame strike. Instead of aura of resolve, the paladin receives scaling resistance to cold (later immunity at 20th level), which extends to allies nearby. Solid, overall, if not perfect. The Serenader bard adds half his level to Diplomacy instead of bardic knowledge and replaces inspire courage with a means to charm person while a performance lasts. At 14th level, a 3-round requiring dominate person can be performed instead of frightening tune.2nd level gets +4 to saves versus charm and compulsions instead of well-versed and 5th level allows for taking 10 on any Diplomacy checks instead of lore master. Solid one. The Soldier of Gaia warpriest replaces the cleric’s spell-list with that of the druid, remembering, thankfully to cover its bases regarding high-level items duplicating spells beyond the capabilities of the archetype. Similarly, spontaneous casting is modified to apply to summon nature’s ally instead. The blessing list is restricted thematically and 7th level provides a vine-based fire-vulnerable black tentacle-variant usable 1/day, +1/day at 13th and 19th level instead of sacred armor. Awesome, intriguing little archetype. The Spellhound inquisitor gets 1st level Spell combat instead of Domain and adds 1 magus spell as though it was a divine spell, +1 such spell at 4th level and every 3 levels thereafter instead of judgments. 8th level nets improved spell combat and 16th greater spell combat, replacing judgments gained there. The capstone provides auto-success defensive casting concentration and +2 to either DC, +2 to increase spell resistance or + 2to atk. Solid blend of inquisitor and magus. The Steel Valkyrie cleric gets full martial and armor proficiencies, diminished spellcasting, Fly as a class skill and is locked into the war domain, treating her class level as +2 for the purpose of domain spells and abilities granted by the war domain and its sub-domains, though thankfully sans early access. At 2nd level, these clerics emit Will-boosting auras with scaling bonuses (getting bonus-types right!) and at 4th level, further AC-bonuses when wearing heavy armor. 6th level qualifies her as class level -4 fighter levels for feat-prerequisite purposes. 8th level allows her to have the armor grow metallic wings from her armor, granting fly speed 40 ft for class level minutes…though the ability fails to specify maneuverability class. 14th level provides a retributive, +atk-and damage-granting aura. All in all, an archetype with cool visuals and very minor nitpicks – like it. The Tavern Brawler begins play with either Throw Anything of Catch Off-Guard. As a full-round action, the tavern brawler can imbibe alcohol to gain access to a combat feat he doesn’t possess for 1 minute. Continuous drinking extends this and daily use-feats cannot be cheesed this way. 6th level allows for the maintenance of 2 (3 feats at 10th, which also provides for more flexibility regarding activation-action, which becomes faster at 12th level) at a given time, and yes, they may act as a prerequisite for one another. 20th level allows for Con-mod such wildcard feats at a given time. This ability replaces martial flexibility…and it rather powerful. Brawler’s Fury may be used with improvised weapons and, at 2nd level, he may retrieve and imbibe two potions at once. 4th level provides scaling bonuses to atk and CMD while wearing light armor or none. 5th level allows for the use of brawler unarmed damage when using improvised weapons at level-4 if the brawler’s damage would exceed that usually associated with the improvised weapon. They also may perform awesome blow with improvised weapons. I like this archetype for its modification of martial flexibility and focus on improvised weapons. The Warding Bastion cavalier replaces charging prowess with the option to make squares in reach difficult terrain for enemies and 4th level replaces expert trainer with scaling AC-bonuses. 6th level allows the warding bastion to immediate action take damage for an adjacent ally, taking half damage for the ally, with additional effects still affecting the ally. Instead of mighty charge, the cavalier increases his reach for AoOs and the number he can perform. At 12th level, he can expend challenge to grant short-term buffs and slightly longer-lasting temporary hit points to allies nearby. As a capstone, he can uses challenge-uses to extend his life, even when dead due to hit point damage. Cool! This one is inspired, interesting and concise – love it! The War Genius investigator has 4+Int skills per level, proficiency with simple and martial weapons as well as light and medium armor and shields, excluding tower shields. As a move action, they may use 1 inspiration to duplicate a witnessed combat feat for class level rounds…sans needing to make the prerequisites, which can be problematic. This replaces alchemy. He may also spend 1 inspiration as an immediate action to gain inspiration die as insight bonus to AC versus a foe whose feat he’s copying via the above ability. Instead of poison lore, he treats his level as fighter level-3 for prerequisite purposes and at 4th level, he can use the feat-copying as a swift action for +1 inspiration. I love this one’s concept and think its mechanics could have used further expansion – that’s some cool mechanics waiting to be further expanded. The final archetype is the Wildfire Druid, who must select the fire domain or one of its subdomains; he may spontaneously cast such spells…which means these guys can, at least fire-wise, outblast sorcerors. Not cool. (Get it? Haha…I’ll punch myself later for that one…) At 2nd level, the archetype can see through fire and smoke etc. sans issues (Nice!) and 4th level decreases fire resistance of adversaries (scaling) for purpose of his spells, which capstone ignoring even immunity. While this replaces wild shape, in combination with the massive blasting capacity, this is very strong. Resist nature’s lure and venom immunity are replaced by scaling fire resistance. Wild shape is decreased to level -2 and gained at 6th level, also eliminating the option to form into a water elemental. 13th level makes foes that take fire damage from his spells gain fire vulnerability for 1 round. Overall, an elemental-themed archetype that is a bit too good regarding its damage-output. If you wanted a pure dire-specialist druid…this will do the job and net buckets of damage. Editing and formatting are more precise than in older Flaming Crab Games-supplements – the rules-language, while still sporting some minor deviations, is more in line with the conventions. Layout adheres to the two-column full-color standard and has gotten rid of the annoying blank space in earlier supplements. The pdf has no artwork, but does sport bookmarks for your convenience. Tanner Wahlin, Alex Abel and C.J. Withers’ second collection of archetypes is significantly more refined than the first – the rules-language is more precise and while there are a couple of archetypes herein that are pretty much broken, there also are some in this book that truly deserve being called “nice”, ones that sport cool visuals and concepts. That being said, compared to some other Flaming Crab Games-releases I recently covered, this one does sport more examples of fast and loose play with balance, where the exchanges of abilities either have been swallowed or are not equivalent – mind you, that’s not a bad thing for underpowered classes like the rogue, fighter or monk, but for already strong classes like the druid et al., this is unnecessary and potentially problematic. Still, this is an improvement over the first book – I actually can see myself allowing some of the archetypes herein in my game after a bit of filing off of rough patches. So, how to rate this? Ultimately, there is a decent balance between the solid and problematic, hence I will settle on a final verdict of 2.5 stars, rounded up to 3 due to in dubio pro reo. 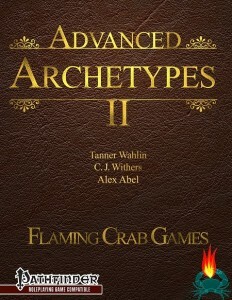 You can get this collection of archetypes here on OBS and here on d20pfsrd.com’s shop!